Forays of a Finance Foodie: Top Chef Seattle: The Finale - Who Will Win it All? Top Chef Seattle: The Finale - Who Will Win it All? One of my all time favorite dishes from Brooke came from Episode 6's Elimination Challenge, where the cheftestants had to cater a homecoming party for actors Anna Faris and Chris Pratt, along with their families and friends. In this episode, Brooke took home the crown (and a brand new Toyota Prius to match) with her Lamb-Stuffed Squid on Black Rice with Coconut Milk. Chris praised for incorporating every flavor. Another guest at their party described it as "one of the best things I’ve ever had in my life." Now I've never had the lamb and squid combination before but that sure does sounds interesting and something I would love to try one day! Another interesting winning dish from Brooke was in Episode 8's Elimination Challenge entitied Jalepeno Business. In this competition, the chefs had to cater an after-game party for Seattle roller derby team, the Rat City Rollergirls. Brooke and John won this Thai Beef with Lobster Jasmine Rice and Thai Slaw. Beef and Lobster - aka my two favorite proteins - now that's what is for dinner! This episode also is home to one or the more "humanistic" moments of the show when John says working with Brooke reminds him of his daughter. Apparently John went through a pretty bad divorce and his wife took his daughter away when she was just a little over a year old (tear!). Episode 8 Preview: Content and/or other value provided by our partner, Bravo. 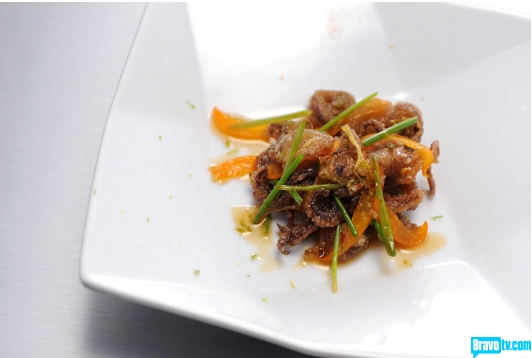 The final most memorable dish was Brooke's immunity winning Ginger-Caramel Squid with Fresh Lime and Chili Powder made in Episode 10's Quickfire Challenge, where the task was to create a dish in 15 minutes using ginger. I've had a very tasty dish before using the sweet caramel and bitter ginger combination so I can imagine that it must have been delicious. Plus, guest judge Wolfgang Puck said that her creative ginger-caramel squid was good enough to put on the menu at Chinois, his new restaurant (which he conveniently plugged a few times during the Quickfire). So who will win? Tune in next Wednesday to find out!